Lahore : Punjab Chief Minister Muhammad Shahbaz Sharif has said that Prime Minister Muhammad Nawaz Sharif, first time in the history of the country, has announced an excellent package for the welfare of farmers and increasing agri production. He expressed these views while addressing a function held in his honour by Pakistan Kissan Ittehad with regard to taking exemplary steps for farmers at a local hotel, today. He congratulated the farmers that today they are meeting at Mall Road in a peaceful atmosphere instead of protest and the problems of the farmers are being discussed in a pleasant environment. He said that Punjab government has also given a historic package of Rs. 100 billion for the prosperity of farmers and development of agriculture. He said that due to these packages, the agriculture will be promoted in Pakistan and the country will become prosperous. Now it is responsibility of farmers to work hard round the clock for increasing agri production and produce grain for the country, he added. He said that package of billions of rupees for the welfare of the cultivators is not a favor but our responsibility and we will continue to take steps for the progress and prosperity of farmers in future as well. Had they did not protest, perhaps farmer package was far more better than this, he added. He said that this package has been reduced due to their protest. The Chief Minister said that Prime Minister has recovered due to blessings of Allah and prayers of crores of Pakistanis and farmers. One day ago his operation, he held meetings with regard to budget and economic council through video link at Pakistan High Commission in Britain, he added. Shahbaz Sharif said that during budget meeting, he was also present in the High Commission. Prime Minister directed Federal Minister for Finance and cabinet members in his presence as well as the presence of others and directed to take special steps for facilitating the farmers as farmers of Pakistan are facing difficulties and great loss has been caused to them. He directed to reduce the prices of agri implements, fertilizers and electricity. He said that Punjab government has put its 50 percent share in the package announced by federal government and will cooperate and put its share in future as well. He said that federal government has given five thousand rupees per acre as compensation to rice and cotton cultivators of 12.5 acre and Punjab government had put its 50 percent share in it but unfortunately no one other put share in it. He expressed the hope that this time other provinces will also put their share. He said that Punjab government has also evolved a programme of provision of interest free loans to farmers having up to 12.5 acre land and hundred percent markup on these loans will be borne by Punjab government. He said that five billion rupees have been allocated for cotton research while billions of rupees earmarked for agri implements. He said that Punjab government will spend 50 billion rupees in 2016-17 and 50 billion more rupees during next financial year under Kissan Package. He said that an agri commission is being set up for resolving problems of the farmers in the province which will include representatives of farmers and with their consultation, steps will be taken for the development of agriculture and welfare of farmers. The Chief Minister said that he will be the head of agri commission. He said that government is fully aware of difficulties of farmers and the damage caused to crops of cotton and rice during last two years. He said that sugarcane growers have been ensued payment of compensation in Punjab. He said that sugarcane cultivators have been made payments at the rate of Rs. 180 per maund in Punjab while the price of sugarcane was brought to Rs. 150 in Sindh. He said that former president of Pakistan caused a great loss to the farmers in Sindh. We were also under pressure but we ensured payment to the farmers, he added. He said it is lamentable that Agriculture University and research institutions did not discharge their duties with regard to agri research and now these institutions will have to give results. He said that seeds of crops giving maximum production will have to be produced so that Pakistan could become prosperous and become able to export its agri produce. He said that Pakistan is an agrarian country but it has to import cotton during previous year. He said that national development has reduced one percent due to destruction of cotton crop. He said that farmers will be given their rights and provided relief in interest free loans, fertilizers, agri implements and under other heads. Shahbaz Sharif said that issue of arrears of electricity bills will be resolved with federal government with their consultation but they will have to promise that decision in this regard will be implemented in letter and spirit and no delaying tactics will be used. He said that soon he will talk to federal government along with their representative delegation. He said that no one is in favor of trade with India but farmers will have to increase production through work hard. The Chief Minister said he considers that if farmers increase production then there will be no need of importing anything from India. He said that he is also against trade with India. He said that at present it is not proper to talk with regard to agri income tax but expressed the hope that this problem will be resolved amicably. Shehbaz Sharif warned sugar mills, as could not pay dues of sugarcane to the farmers despite clear orders; to make payments to the farmers within 15 days otherwise they will be sent to jail. He said that he will not allow anyone to usurp the right of farmers and the sugar mill owners failing to make payments to the farmers will also celebrate in Eid in jail. 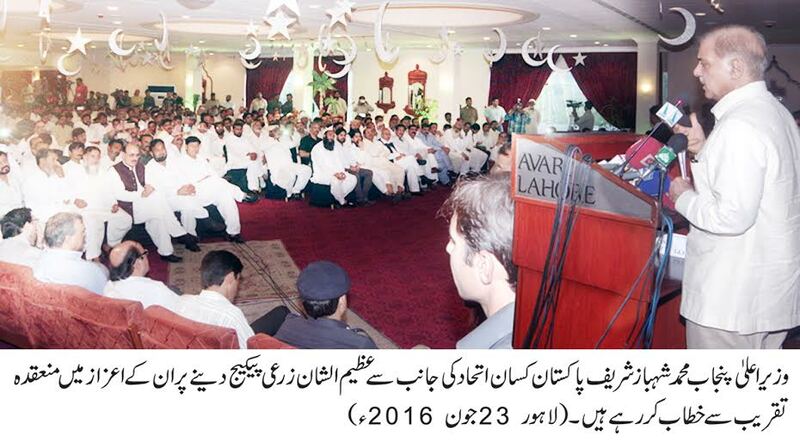 Rana Sanaullah said that some elements tried to instigate farmers against government but Prime Minister Muhammad Nawaz Sharif and Chief Minister Muhammad Shahbaz Sharif have won the hearts of farmers by resolving their problems and said that today farmers are praising them and this ceremony has also been held for them. President Kissan Ittehad Khalid Khokhar said the steps announced for the prosperity of farmers in the federal and provincial budget due to the personal efforts of Chief Minister Shahbaz Sharif is a proof to the fact that Shehbaz Sharif loves farmers. Provincial Ministers Farrukh Javed, Yawar Zaman, MNA Iftikhar Nazir, Chairman Pakistan Kissan Ittehad Chaudhry Muhammad Akram and a large number of farmers were present on the occasion.